Cool, refreshing, minty taste of a menthol cigarette without the tar, smoke and smell of a mentholated tobacco cigarette. The cool chill of the menthol, as it hits your throat, sends a relaxing sensation throughout. 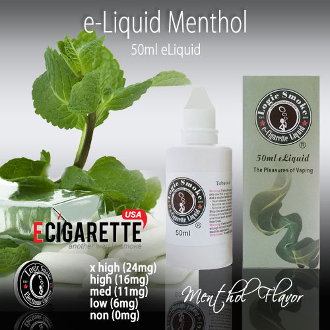 The Logic Smoke menthol e-liquid is a refreshing experience on its own, but many Vapors find it nice to add just a few drops to other Logic Smoke e-liquids such as your favorite fruit flavor or coffee flavor for a cool, minty-fresh kick. With the perfect blend of an 80/20 PG/VG mix (propylene glycol and vegetable glycerin (organic, food grade preservative compounds), you'll get the best flavor concentration along with the perfect amount of vapor to satisfy your vaping needs.